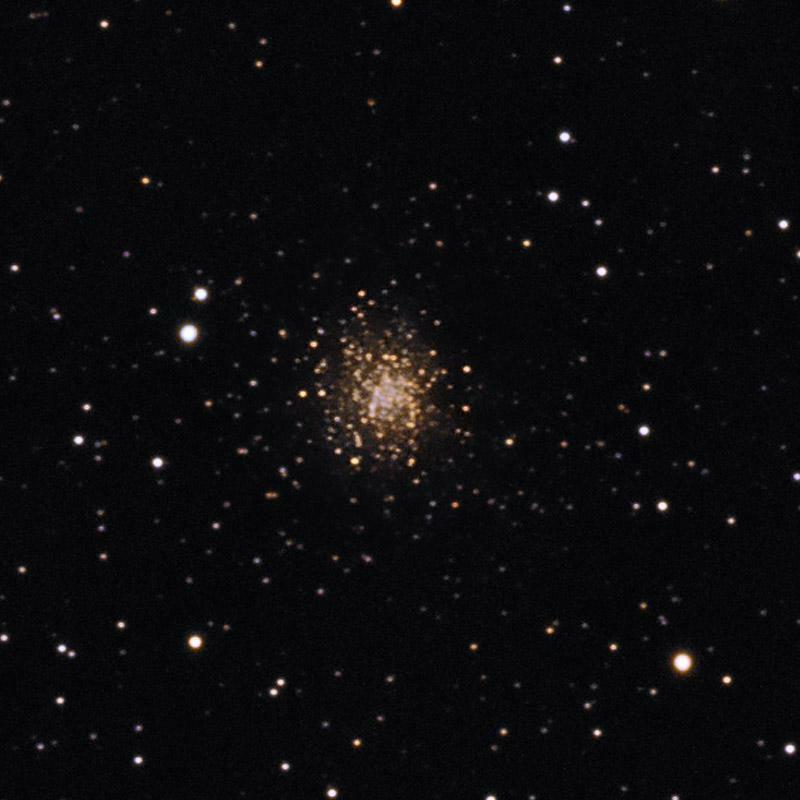 The 15 Palomar globular clusters were found by scrounging the POSS 1 plates back in the 1950's. This was done by astronomers looking for other objects so many contributed to the list. Since no one name could be put on the list it was named for the observatory. Those finding one or more include Harlton Arp while looking for his famous peculiar galaxies and George Abell looking for planetaries and galaxy clusters. Other contributors you might have heard of are Edwin Hubble, Walter Baade and Fritz Zwicky. The Palomar globular list is small so I decided to add it to my project list. I'll be posting one every now and then. Even though I'm a year or more behind in my processing I've still not imaged all I can from this latitude. Pal 1 is too far north in my Polaris trees forcing me to start the project with Pal 2 in Auriga which was discovered by A. G. Wilson in 1955. It is thought to be about 90,000 light-years from us and 115,000 light-years from the galaxy's center so this one is far out in the outskirts of the galactic halo. It's brightest stars are about magnitude 18.8 and are surprisingly red. In fact the entire cluster is very red. This is because it is heavily obscured. The dust gives it a rather odd color somewhat orange instead of golden that you'd expect. I found this in the abstract of a 1998 paper by W.E. Harris et al of McMaster University. "Palomar 2 is a distant and heavily obsurred globular cluster which, unlike the vast majority of such clusters, is located near the galactic anticentre direction. Though it is possibly one of the rare outer-halo clusters that are important tracers of the mass distribution and formation history of the halo, virtually nothing has been known about till now." It continues: "It's integrated luminosity Mvt~=7.9 makes it brighter and more massive than all but one or two other clusters in the outer halo. Very rough arguments based on its half-mass radius and radial velocity suggest that Palomar 2 is now moving in toward perigalacticon on a highly elliptical orbit (e>= 0.7)." Perigalacticon is a fancy word for its closest approach to the galactic center. Due to the obscuring cloud external galaxies are mostly missing from this image. NED lists about a dozen in my field. Only their cores survive the obscuring cloud so they look just like very faint stars. No distance data is available for them. All are from the 2MASS IR survey. I didn't try to annotate them. Nice Rick. I just started to track these down to add to my target list. You beat me to them. Last year I image Pal 4 (four) with a 12" lx200 GPS on a Paramount ME with a Canon 5 D mk2... I always like those unknown and dim objects. Your pal 2 is a very fine image and object! Good luck on the endeavor. You're a bit further south so likely can pick up some, if not all of those too low for me. Most of what I do is well off the beaten track. After doing this for 58 years now I'm pretty sick and tired of the mainstream stuff! Pal 4 is one I've not yet captured. Too many clouds last year. This year is even worse. Still plenty of time if the sky will cooperate. I have 7 more in the queue to process. With a backlog of over one year, it was a poor year due to clouds, I have a long way to go to get to them. Imaging south of -15 degrees is rarely useful so that rules out 4 of them unless some super conditions occur. Pal 6 is below the wall of the observatory so completely impossible.